Hall of Famer Wayne Gretzky's slap shot was always precise and straight as an arrow. Give archery an assist for that. The Great One's aluminum stick, with a wood and fiberglass blade, was constructed in part using innovations derived from bow and arrow technology. So were the shafts on many a golf driver, the bike frame used by an Ironman triathlete, the drumsticks used by rockers. Cutting-edge advances in archery have even influenced the plastic components on dental chairs. It's all because researchers discovered: Getting an arrow to fly with accuracy is anything but straightforward. 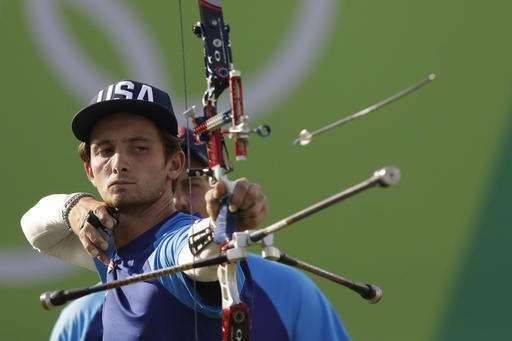 "Ultimately, if you can make a really good set of arrows, everything else is comparatively easy," said George Tekmitchov, target archery manager and senior engineer for Easton Technical Products, a leading bow and arrow manufacturer with a special claim to fame: An Easton arrow has been used to capture every gold medal in the men's and women's individual Olympic event since archery's return to the modern games in 1972. Long before the arrival of Katniss Everdeen—the arrow-brandishing heroine in "The Hunger Games" played by Jennifer Lawrence—arrows were typically made from Port Orford cedar wood. Making an accurate set of those was complex and costly. See, every imperfection in an arrow gets magnified over a long distance. 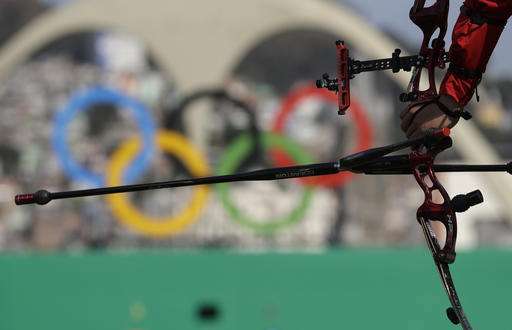 Take the archery competition at the Olympics this week: An arrow will travel about 200 feet per second, and if the stiffness is off by even a ten-thousandth of an inch, it can cause the arrow to deviate by as much as two rings on the target at 70 meters. That can be the difference between going for gold or going home. "We have really high demands for our equipment, because small imperfections make huge differences," said Zach Garrett, who helped the Americans to an Olympic silver medal in the men's team competition on Saturday. "It does take a material scientist to work through these things." Researchers constantly have to think straight, in other words, and Easton has been among those at the forefront of innovation. As the story goes, the company's founder, Doug Easton, was duck hunting one fall day in 1921 when he leaned his shotgun against a car. It fell over and discharged; he was struck in the legs. As he recovered in the hospital, Easton devoured a book by Saxton Pope called "Hunting with the Bow and Arrow." It hit the mark. 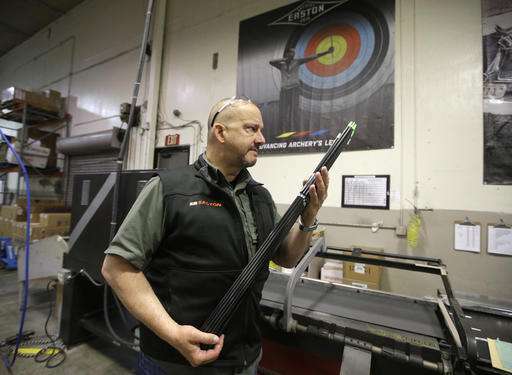 Easton's interest in archery shaped the direction of his company, which has taken arrow technology from wood to aluminum alloy to carbon fiber. One of the biggest breakthroughs was the process of bonding carbon to aluminum, which allows arrows to be strengthened through the aluminum core and stiffened by the presence of carbon fiber. This became revolutionary for other sports, too. Easton innovation expert Gary Filice designed an even more proficient hockey stick—just what the NHL wanted in the hands of Gretzky, who was already virtually unstoppable. The bike frame of Ironman triathlete Paula Newby-Fraser went from aluminum to carbon fiber as she captured numerous world titles. Golf drivers have been made out of similar material, allowing everyone from the pros to the weekend player to crush the ball farther. The bonded-carbon process was also applied inside of aluminum bats and engineered in such a way that when under pressure from contact, the bat can give a higher rebound. Slugger Darryl Strawberry tested different models for Easton, which built a robot to mimic Strawberry's swing. This particular package of specialized carbon bonding also improved windsurfing booms, tennis rackets, lacrosse sticks and even led to aluminum drumsticks like the ones used by rock icon Tommy Lee of Motley Crue, according to Tekmitchov. Space technology developed by Easton found its way into archery, as well. Remember a project from the early 1990s called the National Aero-Space Plane, a "spaceliner" with an ultimate goal of shuttling passengers from New York to Tokyo in 90 minutes? The project was scrapped, but it led to a breakthrough in arrows. Easton developed hydrogen-fueled tubing for the project, and it went into the company's X10 arrow line. The model features an ultra-thin profile for minimal wind drift, and will be used by most of the archers in Rio. A German plastics company was an innovator in the field of micro-plastic engineering for years before dabbling in archery in the 1980s. 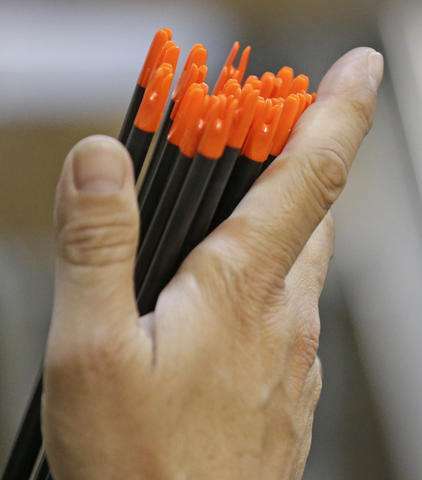 Its founder, Werner Beiter, was a big supporter of the sport and made small plastic accessories like the nocking point, which provides an accurate connection between the arrow and the string. Research into archery equipment affected other products, too, including the part of the dental chair that attaches to cables containing the air for the drills. As for the bow, it certainly doesn't take a backseat to the arrow in technological progression. The dawn of a carbon-fiber limb helped American Darrell Pace capture gold at the 1976 Olympics and again in '84. It's still the industry standard—with a few modern tweaks, of course. The next wave of bows went to a whole new depth: submarine technology. A bow manufacturer called Hoyt, owned by Easton since the 1980s, developed a new core for bow limbs using syntactic foam. Originally designed so submarine control surfaces could be kept hollow without being crushed by sea pressure, the foam makes bows limbs lighter and much stronger. 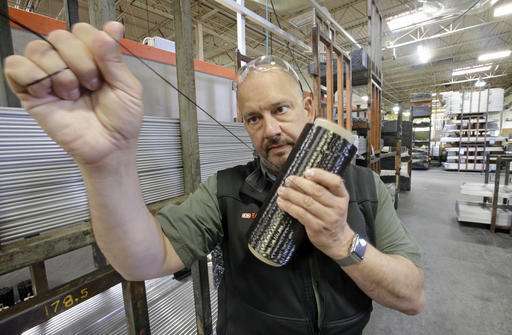 "We're always looking for ways to make something better," said Easton's Tekmitchov. "If someone goes, 'Hmm, maybe that would work for this?' We'll try it."